What is the fist thing potential buyers see when they visit your house? What about the garden path? We all know that having a freshly painted front door, with pots of healthy plants either side, makes a great first impression on visitors. If you are selling your house this is one of the first ‘selling tips’ you will see on many blogs and websites, but have you considered what your path is saying about your property? Does your garden say ‘low maintenance and stylish’ or ‘poorly maintained (because I hate gardening)’? You can transform a shabby garden path in a couple of weekends. Spend some time in the evenings of the first week flicking through gardening ideas, planning what you want and ordering the materials you need. You can use our ‘Creating a Garden Path’ project to help you choose layout, materials, and styles. Then spend the weekend clearing away old paving and laying the foundations. Is it too soon for a revival of crazy paving? The next weekend can be used laying the weed control fabric, gravel or paving, planting some attractive flowers or plants, and doing a bit of sweeping and weeding, to make sure your front garden is saying what you want to potential house buyers. Make the front of your house a great advertisement for what is inside. We have video tutorials on using a disc cutter to help you with cutting paving slabs, advice on weed control, and what sand and cement mix to use to lay your slabs securely and permanently. 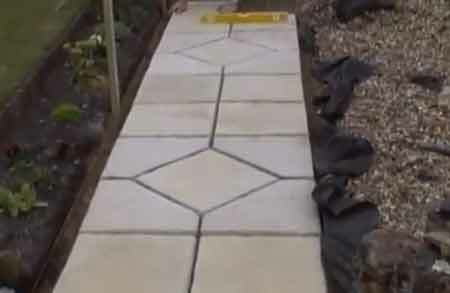 However getting the foundations right is very important so once you have decided which, …er… path your garden path is going to take over your front garden, you should lay a good base of scalping which will allow gravel paths to drain, and will keep paved paths from moving and cracking. We have more tips on selling your house in our Projects Section including a ‘First Time Buyers Guide’ and how to ‘Be an Estate Agent’.